Waiting to see what your publisher proposes as a book cover is akin to waiting for judgement. Publishing people read your book, then sit around in closed rooms discussing design briefs. I’ve never been to one of these meetings but I like to imagine that alongside marketing and sales perspectives, they also involve intense discussions around leitmotifs, imagery and basically how to encapsulate 90,000 words of a novel in a single photo or illustration. Which explains why it’s so nerve wracking when the email with the cover art finally comes through. Will it feel right? Will there be disappointment, horror or relief when you finally dare to click on the .jpeg? Or dare you hope for something even better? For me, the moment my book has a cover is the moment it stops feeling like a manuscript and starts feeling like an actual book. And so I’m excited to share with you the hardback cover for Everything Love Is, designed by David Mann, art director at Bloomsbury. What do you think? I do hope you love it visually as much as I do, and that when you’ve had a chance to read the story next year* you’ll agree it’s clear just how much thought and attention to detail has gone in to the design. *Click here for more details, including places you can already pre-order it if you wish. P.S. Fellow Bloomsbury author, Samantha Shannon, ran a Q&A with David when she revealed the stunning cover of The Bone Season back in 2013. You can read what he has to say about the process of cover design here. Glad you like it, Anne! Bloomsbury do consult me too. We did a bit of back and forwarding before we settled on The Night Rainbow hardback cover, and quite a lot for for the US version. But with this cover, as soon as I saw it I was delighted, and my agent too, so happy days. It would be an even more terrifying prospect if it were presented as a done deal, wouldn’t it?! 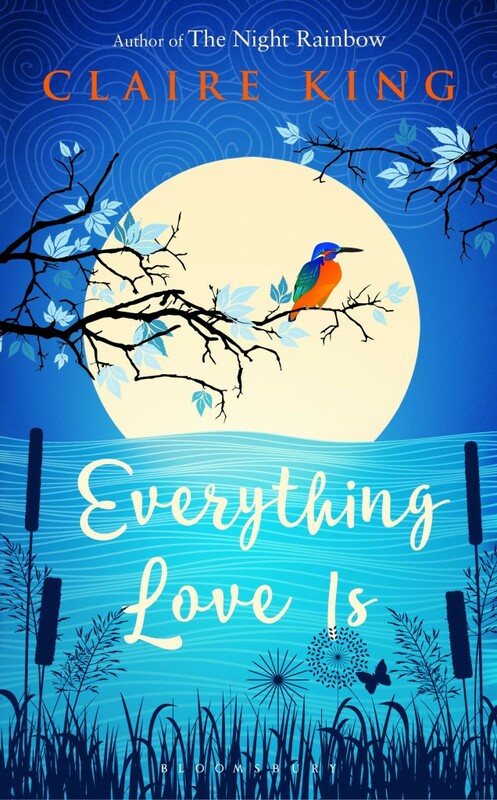 Oh, that is stunning… love the blues & turquoise and can’t wait to read what has inspired such a beautiful cover. Hurray! Thanks, Poppy, glad you like it! Claire it is a lovely design, eye catching and stylish. I know the adage never judge a book by it’s cover are wise words but in this case I have no worries. Looking forward to reading it when it comes out. Will sit proudly next to The Night Rainbow on my bookshelves. Thank you, Joanna! I know people say that, but we are influenced by a book’s cover aren’t we? Even if it is only to be tempted to pick it up, or an image that stays in our mind when we recall the book. I think it will look lovely next to it’s sister! So pleased you like it, Annette! This is going to look lovely next to TNR on our shelves. Beautiful book, inside and out. Love it. I can see stylistic nods to The Night Rainbow, which is lovely. But it’s also a thing of beauty in itself. An oriental style with a contemporary feel. And a stunning colour. I can’t wait to read the book and see how these motifs tie in with the story. So glad you do! There are nods to The Night Rainbow, which is one of the things that is very clever. I also love that the cover image appears to say nothing about the title. It will be really interesting to see what people say once they’ve read the book. Love it! It reminds me of a plate my grandmother had a bit. I think it has echoes of The Night Rainbow too. Love all the detail of the bullrushes if that’s what they are and the swirls in the background. Very striking.